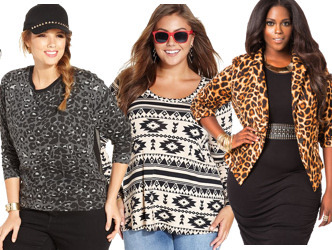 Continue reading "Plus Size Wrap Top"
Fall 2014 fashion trends continue with a focus on the classics, with a casual twist. Reds and Berry colors are the predominant colors along with gray - not many traditional fall colors to be found. Black and white gets even bigger, especially black & white prints. 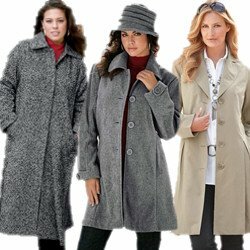 Continue reading "Fall 2014 Plus Size Fashion Trends"
Continue reading "Plus Size Winter Coats"
Continue reading "Plus Size Palazzo Pants"
Continue reading "Plus Size Halter Tops"
Looking for the perfect Plus Size Red Dress? Whether you need a little red dress for the office, church or a special occasion - we've got you covered! So wrap your beautiful self in one of these great red plus sized dresses and go be that lovely Lady in Red! Continue reading "Plus Size Red Dresses"
Plus Size Designer Dresses are almost always a great investment. In addition to being well made and high quality, Designer Plus Size Dresses represent either timeless classics or the Current Fashion Trends AND can make you feel wonderfully special when you are wearing them. 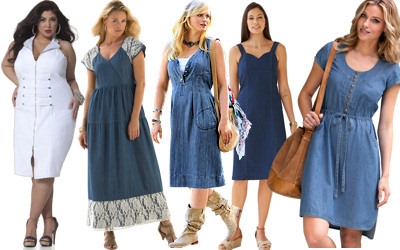 Continue reading "Plus Size Designer Dresses"
There are some really cute Plus Size Denim Dresses this spring and summer. Continue reading "Plus Size Denim Dresses"
Continue reading "Plus Size Beaded Tops"
Continue reading "It's July 4!" Continue reading "Plus Size Jogger Swimsuits"
Plus Size Swimsuit trends styles for this summer include sporty or athletic inspired styles, suits with cut-outs (or peek-a-boo) areas and retro/vintage inspired styles. Continue reading "2014 Plus Size Swimsuit Trends"
Continue reading "Plus Size Summer Dresses"
Spring & Summer 2014 fashion trends continue with a focus on the classics, with a casual twist. Continue reading "Current Fashion Trends"
Casual fashion is the main trend for this summer - tee shirts with attitude and denim cut-offs are right in style. Continue reading "Plus Size Teen Clothing"
Continue reading "Plus Size Halter Swimsuit"
Continue reading "Plus Size Tall Jeans"
When you are looking for a great fit in jeans, it can seem like swimming in uncharted waters without a guide. One tip, however, is considering plus size stretch jeans. Why? Because stretch jeans integrate fabrics like Lycra that naturally show off your shape and give everything a proverbial face lift with support in all the right places. Continue reading "Plus Size Stretch Jeans"
At first glance you may think that the concept of plus size skinny jeans is a contradiction in possible fashion fusions. Skinny jeans also sometimes called cut and fit jeans have designs intended to fit snugly, not too tightly. Most brands use stretch denim for this purpose so the fabric forgives those normal changes in body weight while also keeping the overall feel of the pants comfortable. Continue reading "Plus Size Skinny Jeans"
Plus size women used to wear mens jeans just so the pants fit even remotely, and even then the look was way off. A woman with curves still wants to look like a women and may be hoping to find plus size seven jeans because they are so popular. Many of todays most stylish manufacturers are starting to branch out, but not all. It is important to know your clothing line so you do not get frustrated. 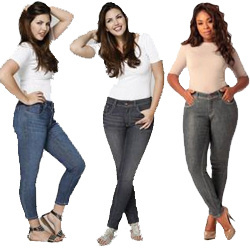 Continue reading "Plus Size Seven Jeans"
Plus Size Levi Jeans are widely available and very popular with plus size ladies for casual blue jeans. Unless you live on a deserted island the word Levis is nearly synonymous with jeans. Continue reading "Plus Size Levi Jeans"
There is something cool about flare jeans. Whether you are looking for a size 7 or plus size flare jeans, flares feel down-to-earth and whisper of the 1960s without quite so much tie dye. The best part about owning a pair of flare style jeans is that the are versatile. If you want comfort and style all rolled into one, this is definitely a cut worth considering. Continue reading "Plus Size Flare Jeans"
You get online and start researching plus size designer jeans. Suddenly you are barraged with mega jean terminology, some of which makes no sense to you. The world of style is filled with wordiness: yokes and frays, distressed and vintage - when all most people want to know is how to find a pair of decent designer jeans that fit your life and your personal tastes. Continue reading "Plus Size Designer Jeans"
Lei plus size jeans are the ideal addition to a full-figured womans wardrobe. They also make their line in junior sizes so that young women who develop early can feel good about their clothing and their body. The entire company has a mission thats focused heavily on self-empowerment and individuality. They believe that there is no one pair of jeans suited to every women, every body type, every lifestyle and the are determined to reflect that ideology in their clothing line. Continue reading "Lei Plus Size Jeans"
The name Lee is a giant in the international jean industry, including lee plus size jeans. The company first became multi-national in the 1960s. This boost them into the enviable position of leading the women's jean market, particularly for their plus size styles. Unlike some companies with very limited options, Lee offers plus size jeans in everything from a Capri, crop, stretch denim, distressed look, boot cuts, and old-fashioned hippy bells. Continue reading "Lee Plus Size Jeans"